Graduate in Electrical Engineering with specialisation on Electronic Equipments for Oceanography and Geophysical Studies. The experience would include servicing and technical sales to R & D organisations, Oil exploration companies etc. Advanced training in Nuclear and Laser related equipments. Closely connected with various professional Bodies and technical associations like Association of Exploration Geoscientists, Indian Geophysical Union, Indian Water Resources Society, Indian Society of Hydraulics, Inidan Geotechnical Society of India, Indian Society of Aerospace Medicine. He has completed his masters in geophysics securing first rank with distinction in first class. 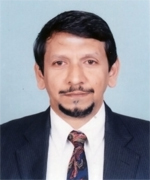 He has an experience of over 25 years in the Geophysical field with leading organizations. He is now heading the Geophysical Division of Electrotek. He has visited principals facility in USA, UK, Canada and have attended international conferences including SEG, SAGEEP & PDAC. Graduated in Instrumentation Engineering with M.B.A in Anna University, he is working with Electrotek for nearly 14 years. He is heading the Optics division and independently handles International agencies. He has visited Principals in Japan, USA & Canada for product training. His main functions include Promoting Remote Sensing and Industrial equipments to all the research organizations in India, organising seminars. He has presented papers in some of the national conferences on hyperspectral radiometry and has attended a number of conferences in the relevant fields. An Engineering graduate with M.B.A. (Marketing & Systems) and 11 years experience at Electrotek. Visited Principals in USA, Canada, UK and Germany for training and has attended international seminars & conferences. Core functions include marketing & promoting oceanography products, business development activities and getting new agencies. He regularly attends Oceanography conferences including Oceanology, Ocean Business & OTEC. B.E. graduate with nearly 14 years experience in Electrotek. Basically Service Engineer, being promoted as Head of Atmospheric & Agriculture division to take care of Marketing & Sales activities. Underwent training of our Principals products in Canada & Germany. Main functions include promoting atmospheric & agricultural products of our Principals & back office technical support to division’s customers. B.Tech graduate with nearly 12 years of experience in Electrotek. Handles installation, demonstration & training with the technical support crew. Visited Principals in Canada and Germany to acquire in-depth product knowledge and training. Handles service queries from customers in India.